Total Assurance Home Healthcare is a team of loving and compassionate caregivers. Our care and assistance are the most sought-after caregiving services in the communities we serve. Since you, our clients, are most important to us, we always make sure to provide you with qualified caregivers who will extend the needed care right in your home. Caregivers are added to our team through a two-step process. They come in and complete an application and an in-depth interview. The applicants’ references are verified and background checks are done prior to hiring. We require an annual physical and TB test to ensure they’re in optimal health to care for our clients. Our caregivers also complete in-services yearly to assure that they’re properly refreshed in training, licensing, and are knowledgeable on medical conditions and care factors that contribute to providing the highest level of care. They are available 24 hours a day, 7 days a week to provide you with extraordinary care. 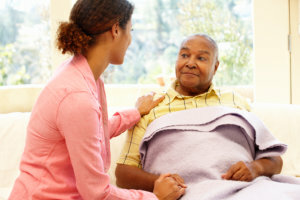 For more details about Home Healthcare Services in Connecticut, contact us on 1-877-372-3885 or leave an online message using our online inquiry form.